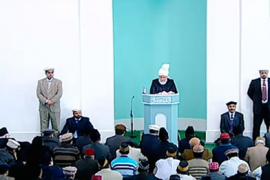 “Today’s Friday sermon was delivered by Hazrat Khalifatul Masih V (May Allah be his Helper) from Baitul Futuh mosque, London. After Tashahhud and Surah Fātiḥah Huzoor said Insha’Allah within 3 to 4 days the blessed month of Ramadan will start. As the days are longer it becomes more difficult to fast, particularly in hotter regions. Despite this fasting is obligatory for all healthy adults. In certain circumstances though there are concessions provided for people who may not fast, for example in hotter regions for labourers and in some other special conditions. Also in some countries where daylight lasts for 22 – 23 hours, the evening is only for 2 hours which isn’t true darkness. Hence, such Jama’ats have been told to fix their Suhoor and Iftar with reference to the Suhoor/Iftar times in nearby countries. Hence this way their fasts would last for 18 – 19 hours. If we do not grant this provision, then there would be no time of Suhoor or Iftar, also there will be no time to offer Tahajjud, Namaz Fajr or Namaz Isha. So such Jama’ats adjust accordingly. Fasting is one of the fundamental pillars of Islam and one has to fulfill this. Huzoor says that there are some questions that are raised with respect to Fasting, about time of Suhoor, time of Iftar, traveling, sickness etc. By the Grace of Allah, hundreds of thousands join the fold of Jama’at each year from amongst Muslim sects & non-Muslims. Other Muslim sects have various views on issues of Fiqh. When these individuals join the Jama’at they require detailed explanations and answers for their questions, as they have had different views previously and followed different commentaries and schools of thought on issues of Fiqh. This can avoid unrest and confusion in their minds. There are also those from different faiths who join us. They are learning from scratch and it is incumbent that they understand the fundamental pillars of Islam. Once in a while it is possible to make a mistake. The Promised Messiah (as) was presented with this situation. A friend from Sialkot asked the Promised Messiah (as) that Ramadan here started a day later on Thursday whereas it should have started on Wednesday because the moon was sighted on Wednesday rather than Tuesday. Now what should be done because one day of fasting was missed? The Promised Messiah (as) said that we should keep one additional fast after the month of Ramadan. With respect to offering Tahajjud & eating Suhoor with the Promised Messiah (as), Hazrat Mirza Bashir Ahmad Sahib (may Allah be pleased with him) narrates that Dr Mir Muhammad Ismail Sahib (may Allah be pleased with him) said that in 1895, I spent the whole month of Ramadhan in Qadian and I offered all my Taraweeh /Tahajjud Prayers behind the Promised Messiah (as). The Promised Messiah (as) would offer Witr prayers in the early time of the night and would offer 8 Rakaats of Tahajjud at a later time in the night, dividing in two each. He would recite Ayatul-Kursi in the first Rakaat and Surah Ikhlaas in the second Rakaat. Also he would recite Ya Hayyo Ya Qayyum bi rahmatika astaghees in Ruku and Sujood. He would recite in a manner that I would be able to clearly hear him. He would then consume Suhoor after Tahajjud and would keep eating till the Adhan had finished . Hazrat Mirza Bashir Ahmad Sahib (may Allah be pleased with him) says that there is no correlation between Adhan and Suhoor. Until daylight breaks from the horizon, it is permissible to partake of suhoor. The time for Adhan is based on the daybreak time. Sharia (Islamic Law) does not say to stop eating for Adhan. When a common man thinks that the daylight has broken only then should he stop eating for Suhoor. The Holy Prophet (Peace be upon him) said that “The Adhan pronounced by Bilal (may Allah be pleased with him) should not stop you from taking Suhoor rather stop when you hear Ibn-e-Maktoum’s (may Allah be pleased with him) Adhan, call to prayer. Ibn-e-Maktoum was blind and would only say the Adhan when he would hear people making noise that the daylight had broken. Last year, I mentioned to a friend that he was eating till late and he kept all the fasts again. He didn’t need to do that if he was following the above. In the western countries, as Adhan is not called it is important to see if daylight has broken. The Promised Messiah (as) said that people don’t follow this and that they should continue to eat even whilst Adhan is ongoing and said that the Muaddhin has called the Adhan earlier today. Fasting was made obligatory to make things easier for a believer and to take away his hardship. Someone who thinks that he remains hungry in Ramadan is actually insulting the commandments of the Quran. Real food is spiritual food which is for the soul rather than food that is for satisfying one’s nafs. One should make sure that they realize that they are fasting and eat accordingly. Some end up gaining weight instead of losing weight during Ramadan. For some people the focus is on food and filling their bellies rather than Ramadan. They indulge excessively in oily foods and sweets during Ramadan. This reduces the blessings of Ramadan. There is a commandment to eat Suhoor and Iftar as they are blessed. One should eat good food but with some moderation. Fasting in a state of sickness and travel is prohibited. Mirza Yaqub Baig Sahib came from a journey at Asr time and the Promised Messiah (as) told him to break his fast. Also when he was asked about sickness he said we believe that we should take advantage of these concessions. Those who say if the sick and a traveller can fast, they should. Promised Messiah (as) said I do not deem this statement correct. Mohayyud din Ibn Arabi did not deem it correct to fast whilst traveling or during sickness and one has to offer that fast again later. The Promised Messiah (as) would allow individuals to fast whilst they remained in Qadian. He did not allow fasting on the day of travel. When Jalsa took place during Ramadhan, guests were served Suhoor. The Promised Messiah (as) has not permitted fasting whilst traveling but has allowed fasting whilst one frequents Qadian and stays. If one plans to stay at a location for more than three days, they should fast. If it is less than three, then they are exempt. The Holy Quran doesn’t specify which journey or which sickness. Also one should adopt that path which leads to righteousness. Hazrat Maulvi Noor ud din (may Allah be pleased with him) remarked that Ibn Arabi said fasting afterwards is obligatory even if one fasts during travel/sickness. As God says to make up the days if you are sick/traveling afterwards. There is no condition that if you fast whilst being sick, then you do not need to fast afterwards. One who fasts whilst being sick/traveling is not obeying the commandments of Allah. The Promised Messiah (as) remarked that just as God has commanded to fast, He has also commanded to not fast under certain conditions. A person who fasts during Ramadan while he is sick or is travelling is disobeying Allah and has to fast after becoming healthy or after completing one’s journey. It is incumbent to follow this commandment of God. Salvation is based on Grace, not by force. God did not specify whether one has a minor ailment or large or whether the travelling distance is short or long. The Promised Messiah (as) would tell individuals to open their fast if they were travelling. When Allah has commanded to not fast whilst traveling, then one should not fast. Once there was very little time left till Iftar, it was after Asr time, the Promised Messiah (as) told his guest to open his fast as he was travelling. He said just a little time is left. The Promised Messiah (as) said you cannot make Allah happy by forcing Him to accept your Fasts rather you can make Allah happy with your obedience. Because Mufti Fazl ur Rehman sahib presented tea to the Promised Messiah (as), everybody was very unhappy with him and blamed him for the incident. When Promised Messiah (as) was told about this incident, he said, he did nothing wrong by presenting me with a cup of tea. Once the Promised Messiah (as) was fasting in Ludhiana but he felt sick and unconscious, he opened the fast immediately. The Promised Messiah (as) would prefer the easier path between the two permissible paths. Hazrat Ayesha (may Allah be pleased with her) narrates the same about the Holy Prophet (peace be upon him). Sometimes Ramadan comes during the harvest time. It is a labourer’s/farmer’s peak time to work. The Promised Messiah (as) said deeds are judged by their intentions. Everyone can evaluate themselves with Taqwa. If one can’t find a replacement (labourer), then they are allowed to miss fasting and fast afterwards. They are counted amongst those who do not have the strength to fast. The Promised Messiah (as) said ‘Once I thought about why Fidya is obligatory. It is for capability. One gives fidya so he becomes capable. This can only happen with God’s grace. If Allah wishes he can grant a weakling the strength to fast. One should pray fervently that O Lord, This is your blessed Month and I feel deprived because I cannot fast. I don’t know whether I would be capable to fast next year or not, whether I would be alive or not.. If somebody prays with such sincerity, Allah will bless such a heart with strength. Fidya is not a replacement for fasting. Fidya can be divided into two categories. Short-term and continuous. Short term entails one has to complete their missed fasts. Continuous would be that they are not required to fast. Fidya rate is one’s individual food. The Promised Messiah (as) would offer Fidya and fast afterwards as well. If one is not capable of fasting, then it is possible to feed a poor hungry person yourself locally or one can donate in orphan fund Qadian. For eating unknowingly by mistake there is no penalty and one can continue fasting. Shariah has commanded children to not fast. They are allowed to offer some fasts when they are closer to puberty. One should not make children fast as it is sinful. At the age of 12 to 13, one should start offering some (one or two) fasts and by 18 years, one should become regular in fasting. It is the responsibility of parents to prevent their young children from fasting. Later when the children grow older, the parents should encourage them. Some young people are not ready to fast till 21 as per development and their physical strength. Hence there is no set age of 18 for fasting. It varies from individual to individual according to their physical strength. The Promised Messiah’s (as) daughter remarked that the Promised Messiah (as) did not like children fasting consistently and once made her open her fast because she was very young. With respect to Taraweeh: what is the commandment with respect to 20 rakaats. As per the Holy Prophet (peace be upon him), it is better to offer 8 rakaats in the latter part of the night but permissible to offer in the early part of the night. The 20+ rakaats started after the Holy Prophet’s time. The Holy Prophet’s (peace be upon him) sunnah was to offer 8 rakaats. Whilst traveling, one can offer Taraweeh on their own. Taraweeh is actually Tahajjud prayers.